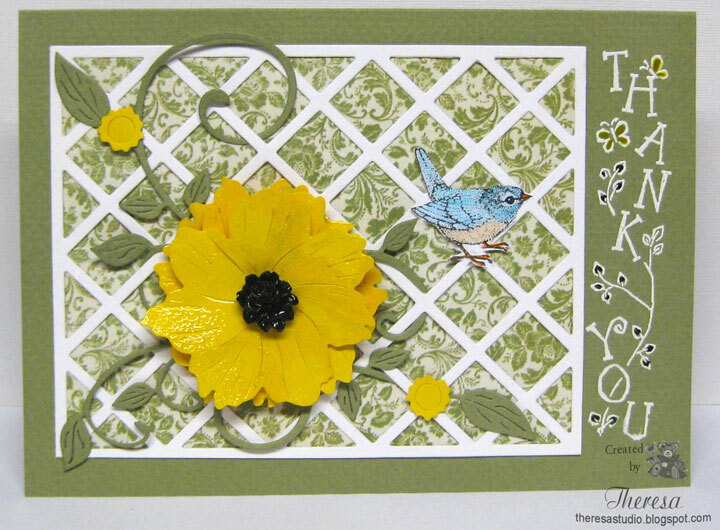 This is a card that I made for Joan's Gardens Challenge but before I get in to that, I want to thank my friend and neighbor, Rita. 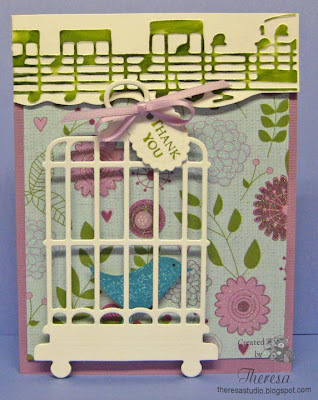 Due to her, this card was made possible because I borrowed from her the die for the lattice, the stamp for the bird, and even the flower I think was punched with one of her punches. I came across the punched flowers in a stash of precut flowers that I did some time ago and I think it was from a punch of Rita's. 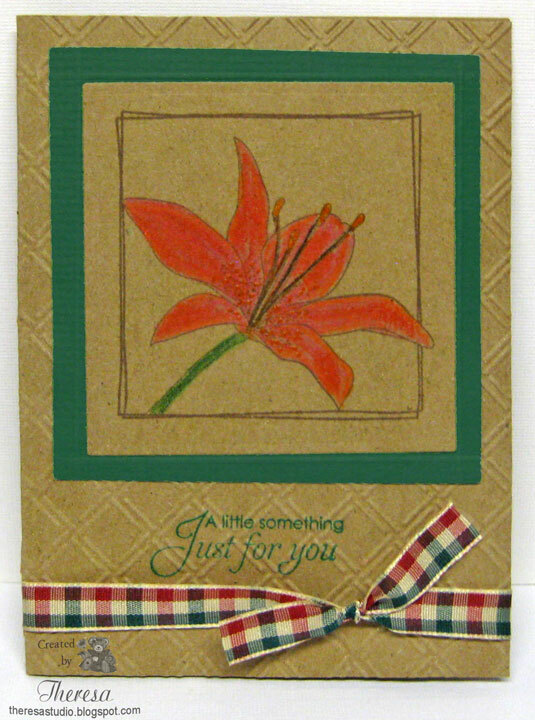 The floral background was even from some scrap leftover from some cards we had made together for a club project. Now back to the challenge. 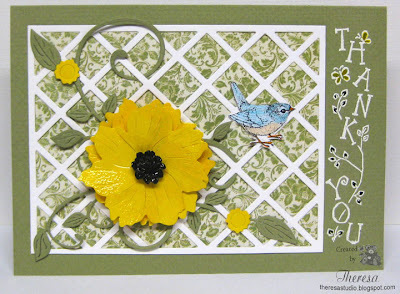 For Joan's Gardens Weekly Challenge #31 we are to use a framed lattice background , any type of flowers , a bird , and a vertical greeting. I think I have all the elements covered. Used 3 layers for flower which I embossed with Clear EP and stacked with pop up dots and used unknown Black Brad for center. My card is sized 5" x 7" to better use the lattice. Thanks, Rita for making this card possible. If I win anything, I will share. This is my 4th and last post today. 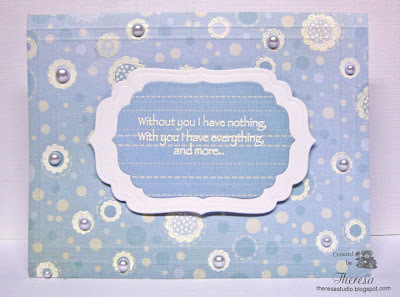 This card is for the Flourishes challenge - Sprinkles On Top. We are to add sprinkles onto our card or creation in the form of Glitter? Beads? Flower Soft? Glitter is the least favorite of items that I like to use. 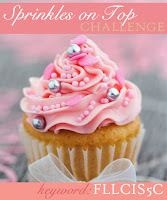 But I am committed to finishing all 4 challenges...guess that is why I am doing this one last-putting off using glitter. I pulled out this Gala Glitz Gold which I bought last year but have only used once. After using it today, I remembered why I have not used it again. I also pulled out a stamp and die in my collection that has never been used. I wanted to make something different and guess I did that. Stamped the wreath stamp, colored with Copics and cut with circle die and covered any white area with the glitter. Attached to Kiwi Doily and then to green card base. Finished with a strip of paper at the bottom to which I added a sentiment and a stripe of glitter. Simply did this with placing Scor-Tape on the strip and sprinkled on glitter. 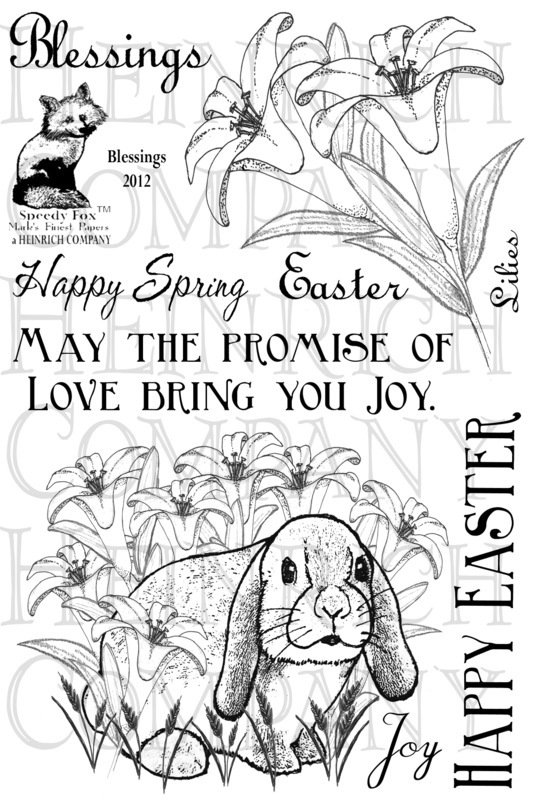 Flourishes Stamps "Wreath of All Seasons" and sentiment from "Summer Blossoms"
Hello! 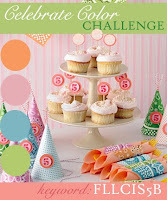 I am back with a third challenge for Flourishes 5th Birthday Celebration. This is their Sweet Celebration Challenge which is to use a focal image or sentiment that is SWEET. 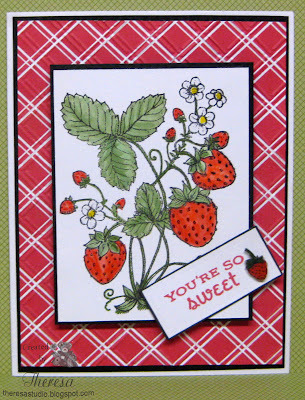 This was an easy one for me since I knew I wanted to use Flourishes Sweet Strawberries Set. I even cased an earlier card that I had made but used a different paper and a different embellishment. For this I used a digital paper for the background but changed the color from green to red before printing. I also embossed the mat with CB EF Wicker Weave. I made my strawberry embellie by stamping the single strawberry on shrinky dink and colored with pencils. I made a bunch of these for my stamping club. Hope to return for one more Flourishes challenge ...but I have to create a card first. I am back with another card for the Celebrate Color Challenge for Flourishes 5th Birthday Celebration. The challenge is to pick up the hues in the inspiration photo shown below left and create a card. The colors that I used in my pot of zinnias are Orange, Pink, and Green. I have captured the Blue and Green in the paper pieced pot. 2down, 2 to go for Flourishes Celebration. Butterflies and Bees, Oh My! 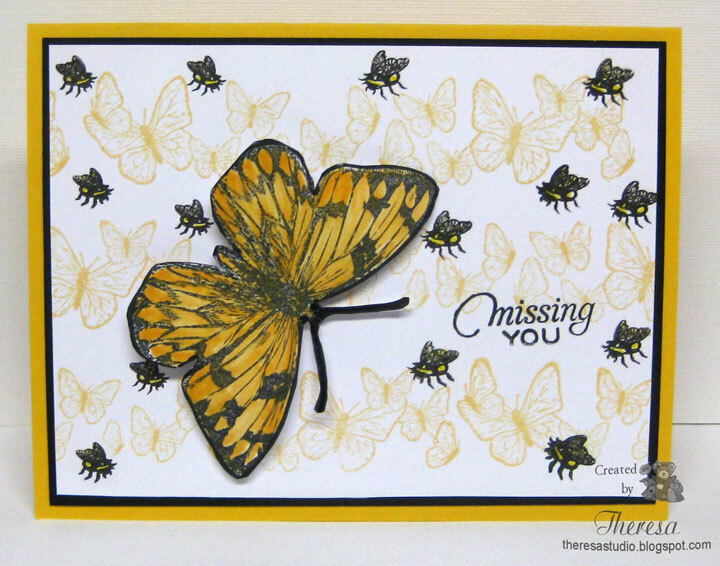 This card is a bit humorous....combined bees and butterflies. I do not think I have ever seen a swarm of bees flying with butterflies but it just turned out that way. I was making a background by stamping rows of butterflies and decided it needed a bit of pop, so I stamped the black bees. The large butterfly was stamped, colored, cutout and attached with pop dots. Timeless Tuesday #183: Challenge is “Butterflies, Bees, Spiders, oh my! 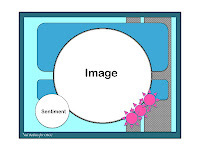 Use an insect image(s) and/or element(s) for your card/project. 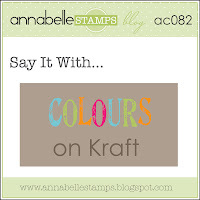 Anything Goes Challenge Blog: Make your own background. Flutter By Wednesday: Friendship is theme. Happy Monday morning! Labor day is fast approaching and that means summer will be over. The challenge at FOSTV this week is Labor Day Cards. I decided to incorporate the colors Red, White and Blue with a theme of what one might do on the last holiday of the summer in the states. 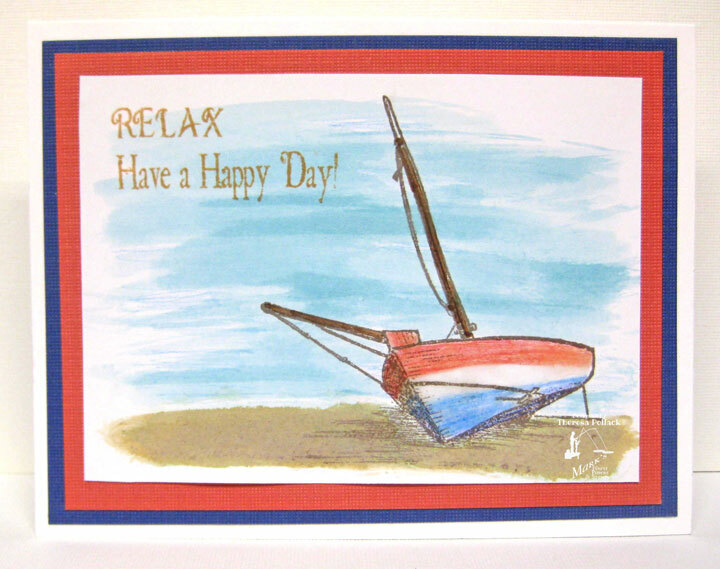 I came up with this beach scene that I water colored with the sail boat in the foreground. Thought the sentiments were appropriate wishes for a holiday away from work.. 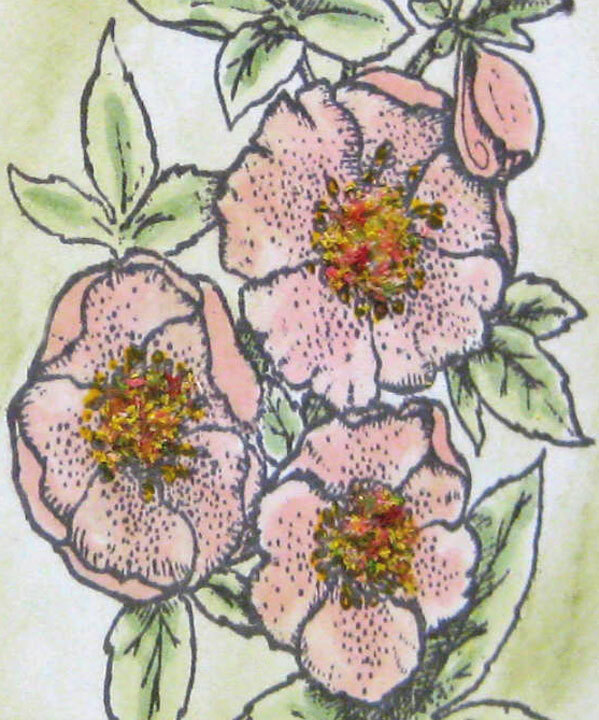 I used stamps from Mark's Finest Papers, a Heinrich Co.
Sweet Stamps Blog: Watercolor -Used distress inks to watercolor background. One of my fave images to work with are butterflies of all kinds. I love this new butterfly stamp that I received from Repeat Impressions. 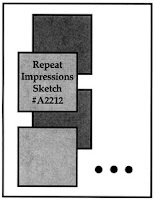 I am using it in a card for the current sketch challenge at The House That Stamps Built and the challenges below..
What If Wednesday: Repeat Impressions Sketch A2212. See below. Tuesday Throwdown: Hip to be Square-use squares on your project. 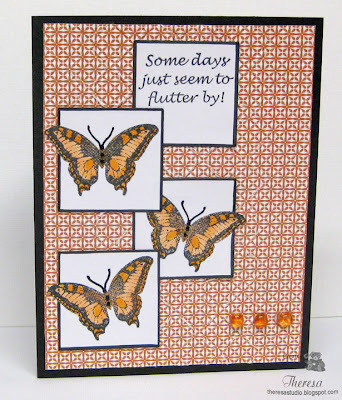 Sweet Stampin' Challenge: Extend out of the frame....all 3 butterflies flying out of frames. Timeless Tuesday: Butterflies, Bees, Spiders, Oh My! Use insects on your project. According to the City Crafter Blog, Washi tape is all the craze today. You can buy from several sources or you can make your own which is what I did. There are several tutorials and videos to learn how to do. Just google and find the way to make your own. I viewed several "How To's" and made mine with tissue papers and Scor-Tape. I never throw away tissue papers from gifts or from wrapped purchases so I have a lot of tissue to use. On the left is a photo of some I made with half inch scor-tape and a 6"x6" square of scor-tape. They were all made with print tissue except the one with strawberries was white tissue that I stamped and colored. I need to get some 1" tape which I think I'd prefer. 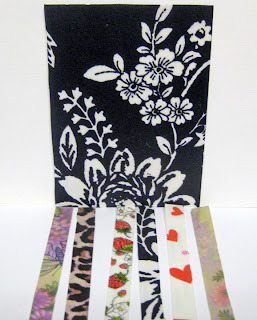 City Crafter is challenging us to use Washi or Tissue tape on our projects ... it can be store bought or handmade ... but there is a catch ...you are only allowed to use 2 other items with the tape on your projects! 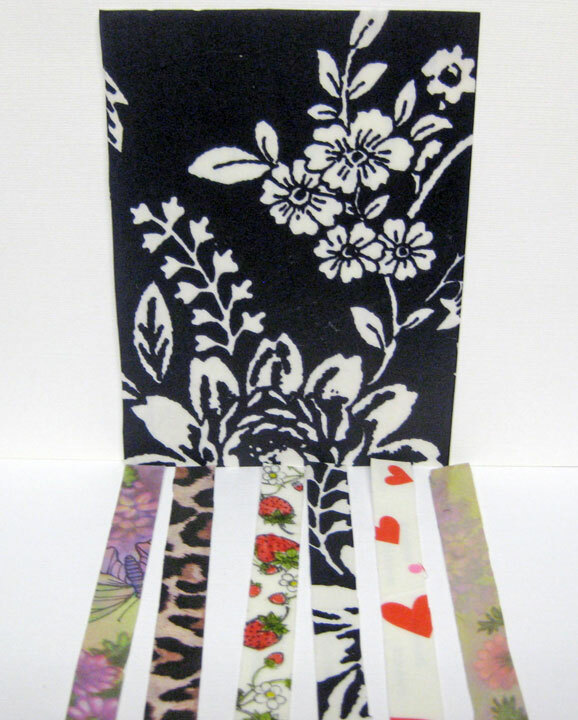 On my card I used 2 strips of tape....a 1/2 " strip and a 2" strip that I made of a black and white pattern tissue paper. The paper is shown behind my card in the photo above. My 2 other items used are ribbon and a stamp. The Play Date Cafe: Color Splash Challenge-use black, white and a splash of lime. Stamp: Stampin Up "Thank Up"
Good Morning! How did your week unfold? Welcome to another challenge from Speedy Fox and Friends. 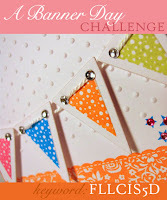 This week the challenge is to Use a Different Fold on your card. There are so many great folding techniques and I decided to use the side step fold. 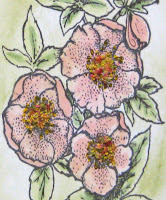 Check out Anne Harmon's great tutorial at Speedy TV for details if you'd like to make. 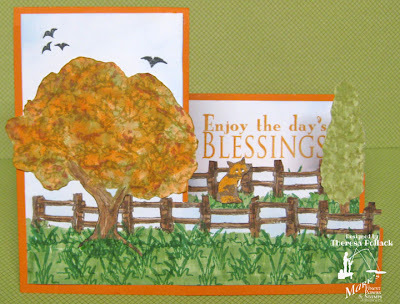 For my design, I used several stamps from "Tree Greetings" "Scenic Selections" and a sentiment from "Daffodil Greetings" all from Mark's Finest Papers, a Heinrich Co. My card was created with several colors of Copics and Memento Inks and White and Orange CS. 10 different stamps were used. The Photo above left shows the card spread out to better show the folds. I am back to making Christmas Cards...I seem to be all over the place with challenges this week. This was made for Craftyhazelnut's Challenge to include a building on our card. 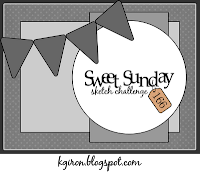 I have used a sketch from One Stop Craft Challenge and also BasicGrey papers so will enter this in those challenges too. I have used an old favorite stamp by PSX "Christmas Village" colored with Copics, Markers and Pencils. I stamped with Memento Tuxedo Black and used only the center part of the stamp. The sentiment is from a Flourishes stamp set. 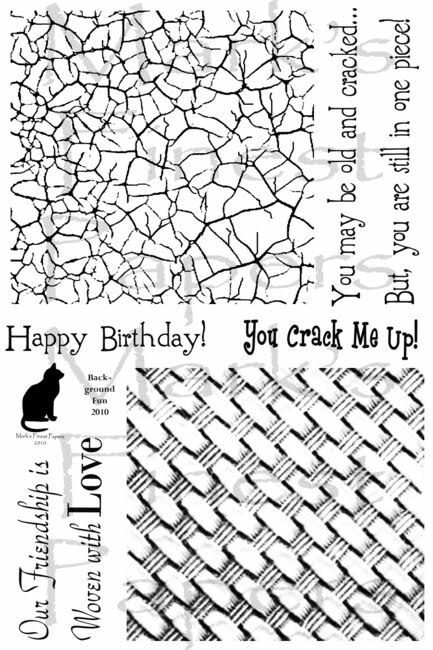 Corner punch and Spellbinder dies used also. Papers are Patterns from BasicGrey and Solid CS from stash. Craftyhazelnut's Christmas Challenge: Include a building. One Stop Craft Challenge: Sketch shown above. BasicGrey Challenges: Anything Goes with BasicGrey product. I used Scraps of Figgy Pudding Papers. 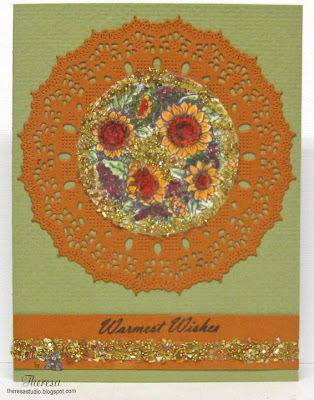 This is a fun card that I made for Cheery Lynn challenge to use Doilies. 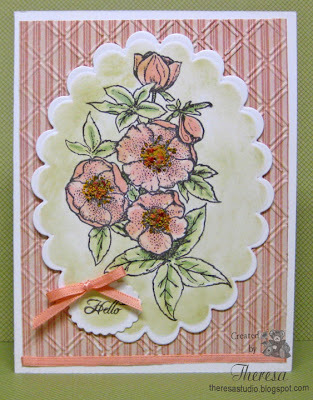 She has the most beautiful Doily Dies and they are so easy to use. I took a bit of artistic license in utilizing one of her Snowflakes to decorate the Balloon and a Tropical Leaf die to create a spot for the sentiment. Lili's Little Fairies: Use spots or stripes with LOTV Stamp...both on balloon. Whoopsi Daisy Challenge: Include a sentiment. Do you ever just try and try and just cannot capture the true color in a card in a photo? I just could not get the background behind my card to show white but the colors in the card show up the white as well ...white. This card was made with Annabelle's Stamps Dotted Flowers and Floral Silhouette and focuses on the sentiment and uses DP for the shades of blue. Stamped and embossed some of the circles with flowers and randomly added pearls for some depth and richness. Pearls are white but look blue because of reflection of color in paper. Digi Doodle Shop's Best: Use Pearls- used lots of pearls. PaperPlay Challenge: Use sentiment as main focus. Thanks for stopping by. I appreciate all comments. Welcome to the challenge at Friends of Speedy TV this Monday. 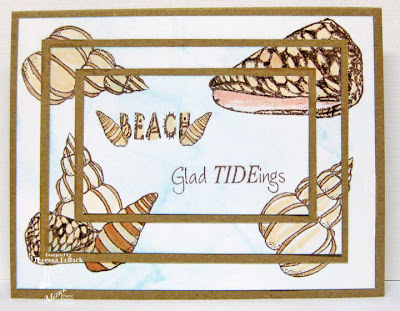 This week, we are doing cards with a beach theme. 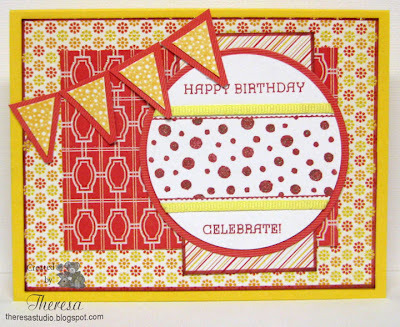 I have been seeing a lot of cards recently made in this Triple Time Stamping style. See details on this video here. So I thought I'd use this for my beach theme project. 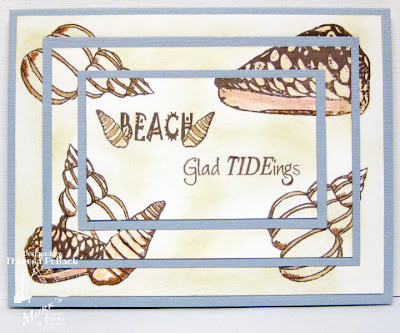 I have used "Silly Shells" Stamp Set from Mark's Finest Papers, a Heinrich Co. I made 2 cards using the same stamps and layout but changed up the colors and papers. Which do you like the best? For those who enter the challenge at Speedy TV this week, you have a chance to win "Background Fun" a MFP, a Heinrich Co stamp shown on the right. At Flourishes Timeless Tuesday, Cindy is the hostess and wants us to use Kraft paper on our project. I used Kraft for practically the whole card except for an orange CS Mat. I stamped the Palm Trees from Flourishes "Beach Life" Set on GKD Kraft CS with Memento Rich Cocoa ink and colored with pencils. I sponged some clouds in the sky with Memento Summer Sky and Ranger Distress Ink Tumbled Glass. I just kept coloring and sponging until I was satisfied with the scene hoping not to overdo. The sentiment was stamped on the Kraft with Memento Morocco Ink. Added my brown brads for coconuts. 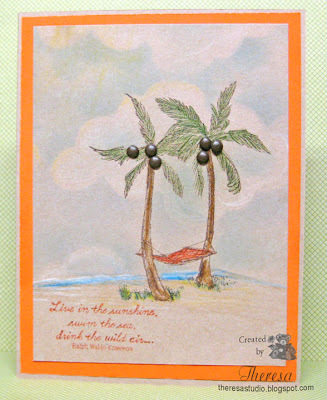 Used Kraft card base with orange mat topped with the beach scene. 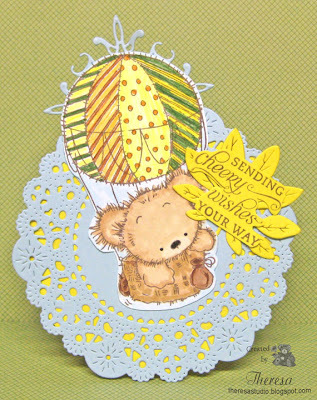 I have done another card very similar to this but using Kraft creates a whole new look and style. Had to add some white with a pencil to keep sky and sand from being too dark. A Blog Named Hero: Challenge is to incorporate Kraft into a project. Allsorts Challenge: Use metal--metal brads on trees. 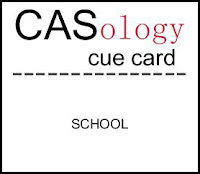 With the beginning of the school year approaching, many card challenges are about school themes. 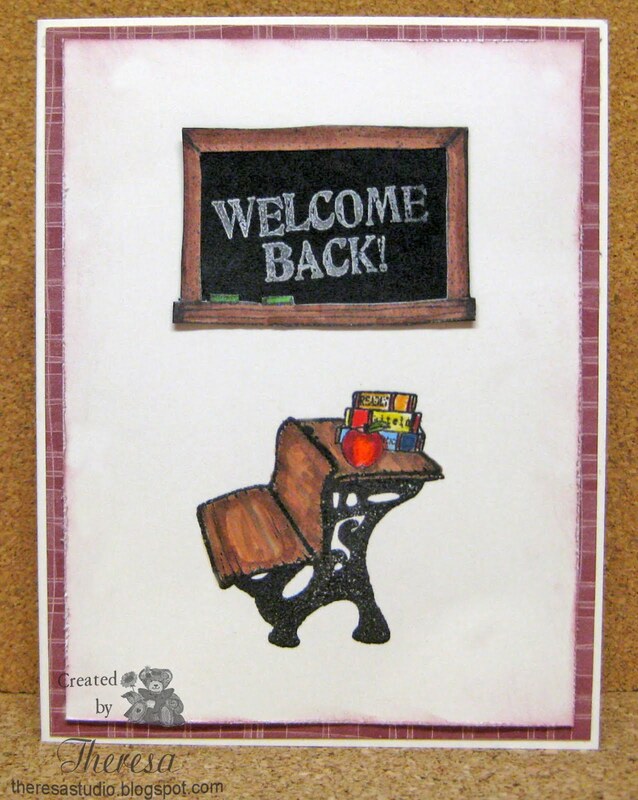 I designed this card welcoming the start of school using a new Stamp Set "Lesson Learned" from Mark's Finest Papers, a Heinrich Co. I stamped the old style desk.....remember sitting in one of these?....with Versamark on GKD Ivory CS and embossed in Black Embossing powder. That gives the black metal look that this desk had. I colored with Copics giving the seat and back a worn look from many pupils sitting in the desk over the years. I stamped the blackboard frame with Memento Rich Cocoa and colored the frame with Copics but inserted black CS for the board and stamped the chalked "Welcome" with Brilliance Platinum Planet. The board was cut out and hung in the schoolroom.....remember the green chalk eraser from "those days"? Finished the card with Ivory Card Base, red pattern mat (unknown from stash) , and Distress Ink Aged Mahogany around edge of image. If you say that you remember sitting in one of these desk, I have a good idea of how old you are! Hello again! 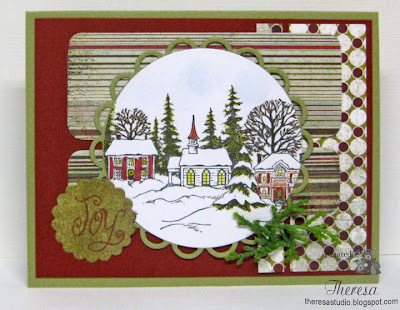 I am back with a card for another challenge at The House That Stamps Built blog. This time it is the Designer's Choice Challenge DCC815 - to use scoring on you card. I could not card without my Scor-Pal or at least not enjoy doing it as much. I used my Scor-Pal to create a background for this card by scoring lines in a grid pattern making a somewhat tile design. After that I used a pod to add Memento Grey Flannel ink to highlight the score lines making it appear to look like marble tiles. I placed this on a card base of Yellow CS. 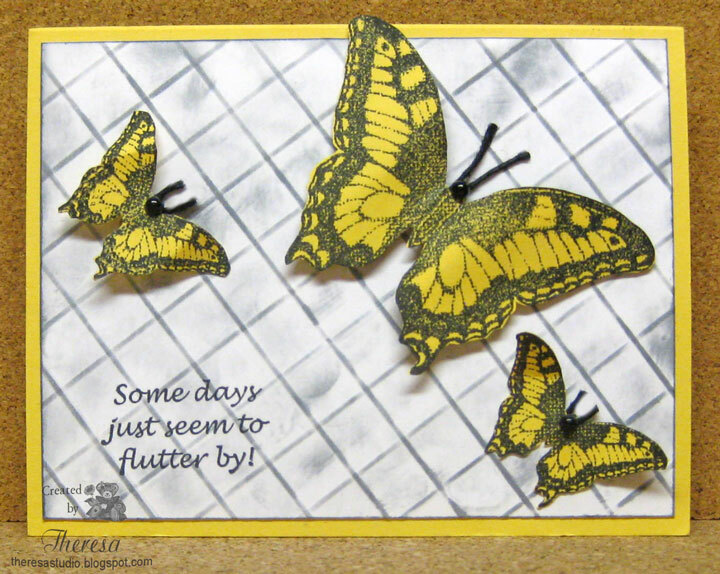 I stamped 3 butterflies - 2 small and 1 large on the same Yellow CS with Memento Tuxedo Black and cut them out without the antennae. I added twine to replace the antennae as I attached them to the card. Also gave each a black Pearl Head. 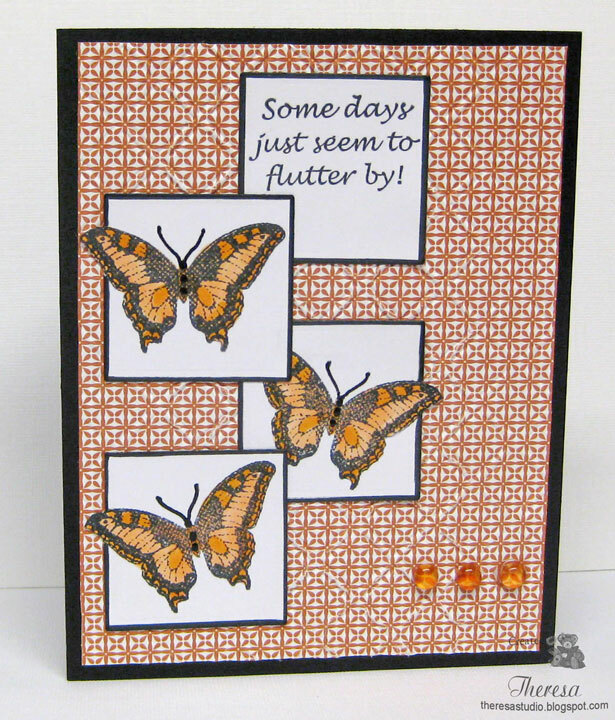 Used the sentiment "Some days just seem to flutter by! " thinking that this entire summer seems to have fluttered by and so quickly! All the stamps used in making this card were from an unmounted sheet of stamps that I won from Repeat Impressions....love using them. Aren't the details on the butterflies just beautiful! 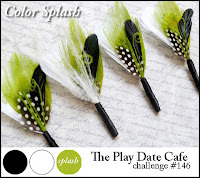 Flutter By Wednesday: Open challenge...must have butterfly or fairy. Welcome back to this challenge blog. One of the fun things to do on a very hot summer day is to enjoy a slice of cold watermelon. I recently was lucky to win a prize of a Repeat Impressions stamp sheet from The House That Stamps Built and this great stamp was included. I used it in this card for their sketch challenge shown below. 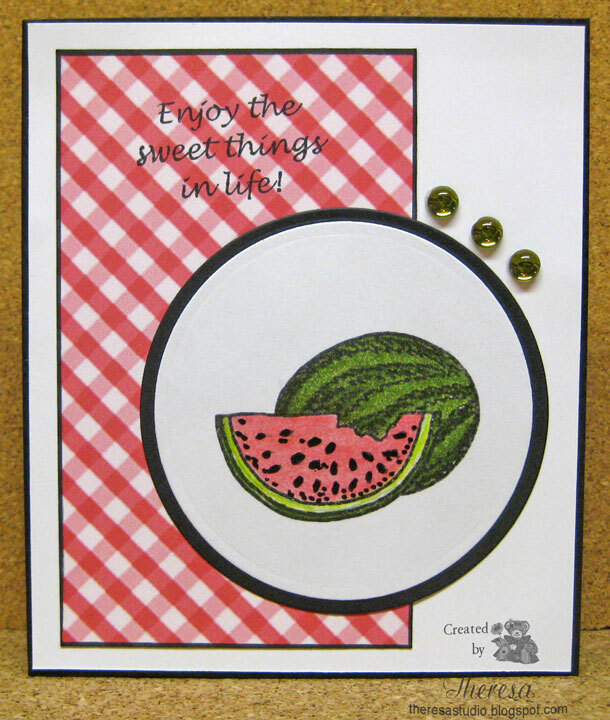 Simply stamped the watermelon with Memento Tuxedo Black ink and colored with pencils and highlighted the seeds with Black Glaze Marker. I cut with a circle die and matted on black circle mat. 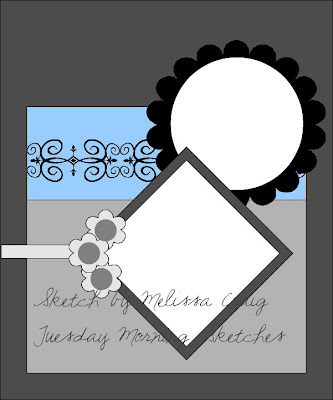 Used a check mat ...so summery looking..outlined in black. 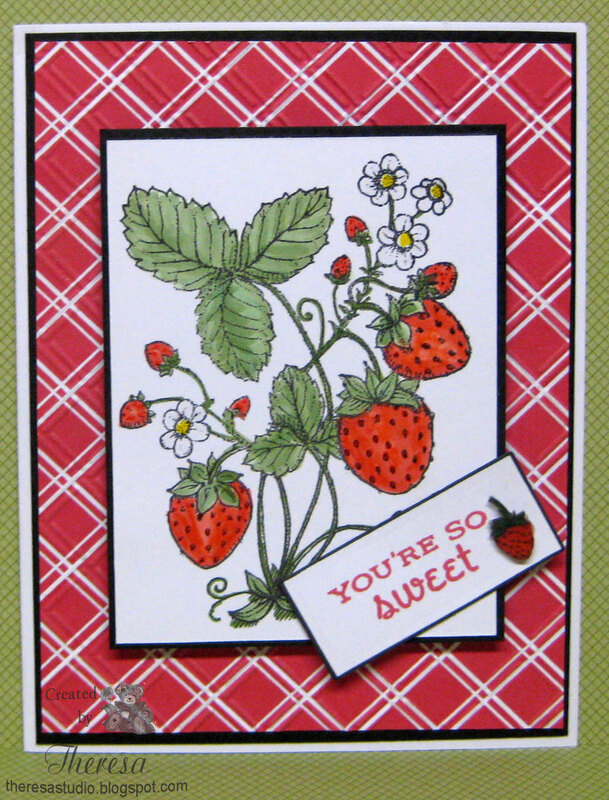 Finished with sentiment from same stamp sheet and some Annabelle green sprinkles using white CS mat on Black CS card base. Could have added more but liked the clean look of this simple layout. Now I need to make a card for their other challenge using scoring. Happy Saturday. Welcome to another challenge at Speedy Fox and Friends. Today we are doing friendship cards. It is always nice to have cards on hand for friends to send to let them know that you care about them or are thinking of them, especially when they might need cheering up. 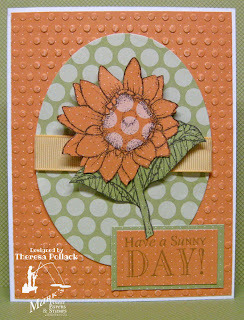 For my card, I used a recent stamp release "Bring on the Sun" from Mark's Finest Papers, a Heinrich Co. 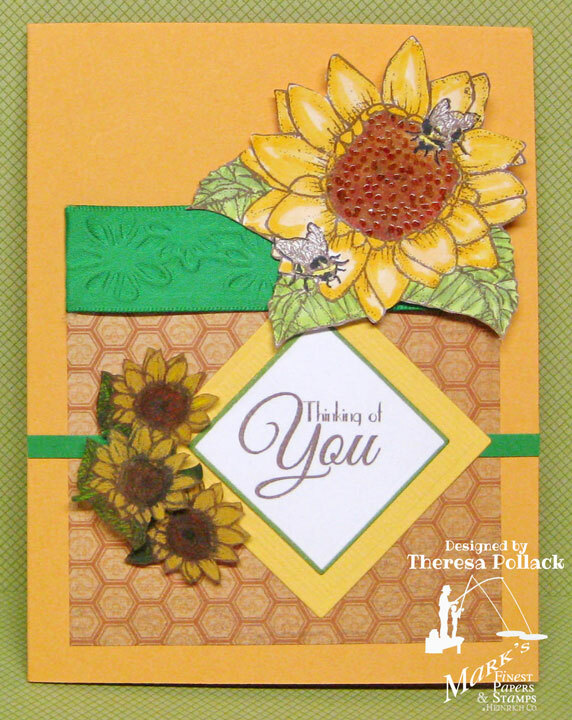 I stamped the sunflower image with bees and colored with Copics and cut it out. I highlighted the bee wings with Clear star pen. I stamped another sunflower image on to Shrinky Dink and made some embellishes for the card. Using a sketch from Tuesday AM sketches, I completed the layout with ribbon, pattern paper, and my sunflower embellies. 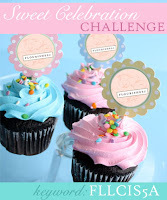 Please join us in the challenge this week for a chance to win a MFP stamp set. You have until 3PM on Friday August 24 to post your card. Remember, if you use MFP, a Heinrich Co. stamps your name will be entered into the drawing twice. 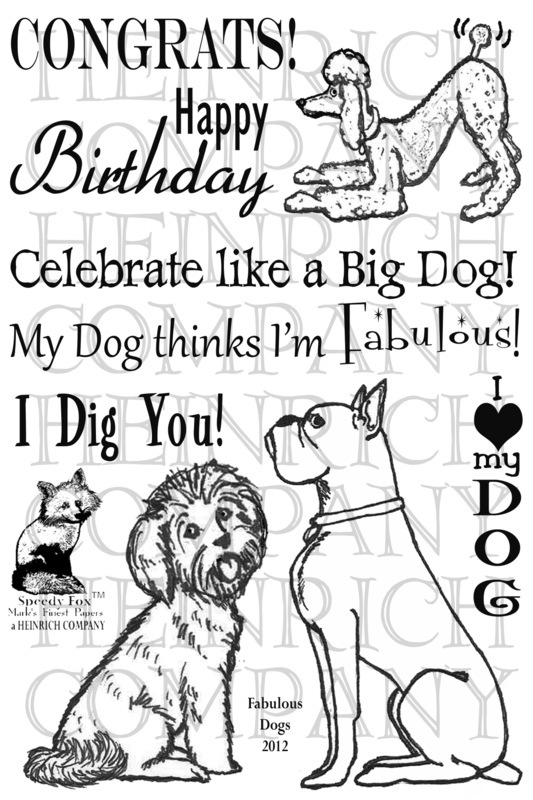 Oldie But Goodie Challenge: Friends....Old Shrinky Dink Sheet, Papers all 1 yr or older, Old Ribbon. Happy Friday! It seems that I am making more and more CAS cards. Today at CAS-ual Fridays the challenge is to create a project featuring something in or on the ocean. I have this new Mark's Finest Papers stamp set that I have been wanting to play with and this is the perfect set "Oh, Crab" for this challenge. 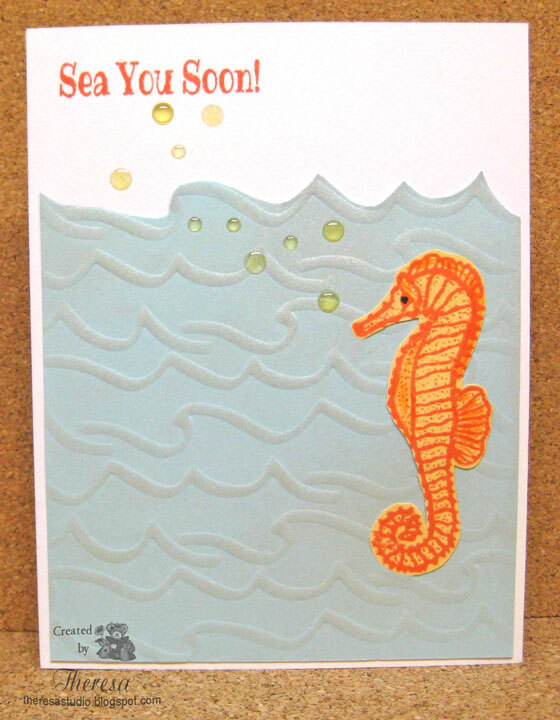 I stamped the seahorse on a yellow CS with Memento Morocco ink and cut out the design. I took some Bazzill Blue CS and embossed with Fiskars Texture Plate Ocean Wave and sponged with Brilliance Platinum Planet ink for some shine. I cut out a section of the ocean and attached to a White Base Card. I stamped a sentiment from the same set in the same ink. Attached my Seahorse and some bubbles ( Cloud 9 Design Plastic Rain drops). Looks as though the seahorse is talking??? Fun card ! Fun stamp set! 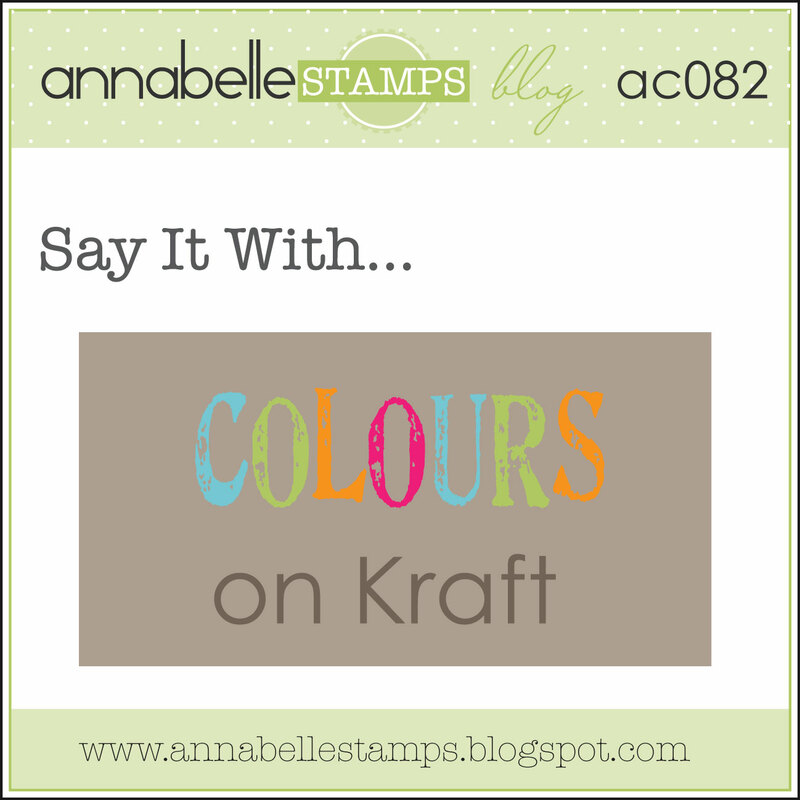 Today, my card is for the challenge at Annabelle Stamps - Say it with Colours on Kraft. I would call this a quick and easy card. 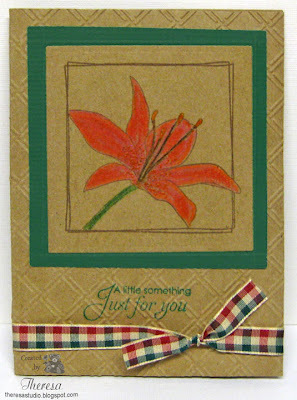 I stamped the daylily on Kraft and colored with pencils, cut with a square die and placed on square mat of green cs. This was attached to an embossed card base of kraft and finished with a stamped sentiment and plaid ribbon. Stamps are from Annabelle "Squared Poises". Papers and ribbon are from stash. Inks are memento Rich Cocoa and SU Glorious Green. 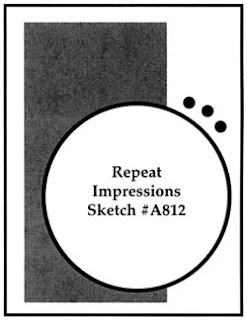 For Flourishes Timeless Tuesday Challenge this week, we need to use the sketch shown below. Since I was working on another challenge to use green and purple, these colors ended up in this card as well. I used Flourishes happy singing bird from "Spring Has Sprung" and one of the set's sentiments and another sentiment from Taglines. To tie in with the singing bird I embossed the EF Allegro on the pattern paper, but I lost the design somewhere as I did the layering. OOPS! But it does show on the real card but lost in the photo. 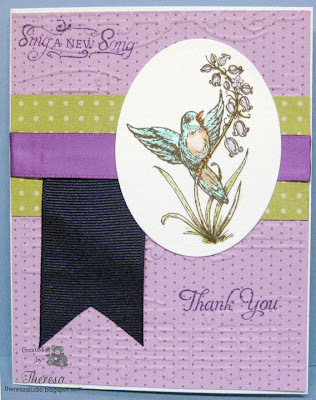 I started with a Pattern Paper placed on card base of purple. I embossed a glossy white strip with Cuttlebug "Allegro" and sponged with Distress Ink Peeled Paint and attached to top. 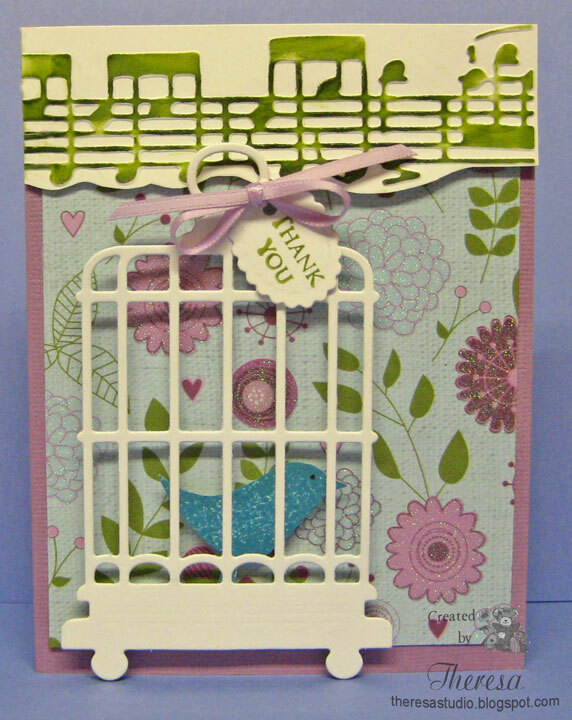 Then I attached Bird Cage with a Blue Bird with pop up dots and tied on sentiment with purple ribbon. Welcome this morning. How was your weekend? Welcome to today's Friends of Speedy TV challenge. The challenge this week is a color challenge to use Pink, Cream/Grey, Pale Green in your projects. I have all those colors in my background that I made with the shaving cream technique. If you are interested how to do, check Lois' Tutorial here on Home of Speedy TV. My focus image is from MFP's,a Heinrich Co. "Asian Delights". I stamped the Cherry Blossoms in Memento Gray Flannel and colored in Pink and green Copics on cream CS and sponged with Distress Ink Spun Sugar. I cut this with Spellbinders Labels 4 Die. I assembled all on a card base of ivory with a pink satin and organza ribbon. 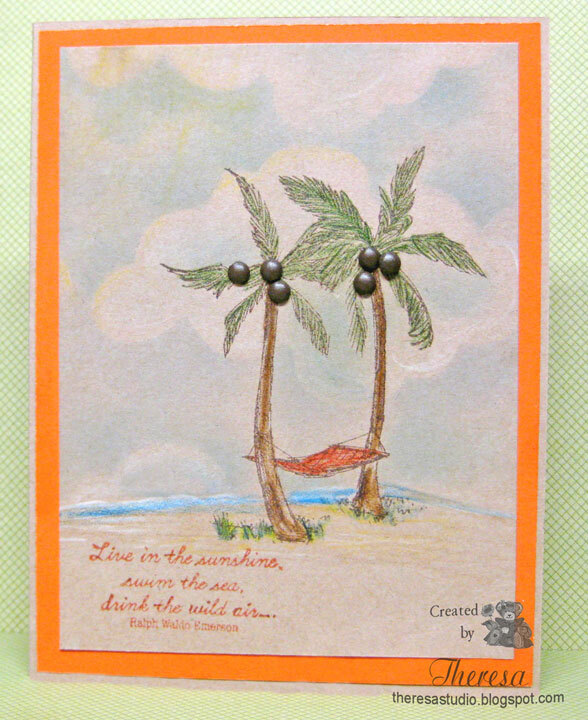 The sentiment from "Bring in the Sun" was stamped in Memento Bamboo Leaves making this a birthday card. Good morning. Welcome to another challenge of Speedy the Fox and Friends. This week we are asking you to use dots on your card or project. I am using a soon to be released stamp set from Mark's Finest Papers, a Heinrich Co. "Bring in the Sun" and doing some paper piecing to create my flower with Dotted DP. I stamped the flower on 3 dotted papers from SU and cut out and assembled the design for the flower. For my background, I cut a mat of orange dotted DP and embossed with Cuttlebug Polka Dots EF and attached it to White Card stock. I then layered an oval of Green Pattern Dots and added some ribbon and topped with my Flower of 3 different Dotted DP's. Finished with a sentiment from the same stamp set stamped in Memento Pistachio ink on Orange DP and layered on the Green DP. I kind of went crazy with all the dots but hope you like the results. Please join us in the challenge this week for a chance to win a MFP stamp set. You have until 3PM on Friday August 17 to post your card. Remember, if you use MFP, a Heinrich Co. stamps your name will be entered into the drawing twice. May you all enjoy a fun and sunny day! 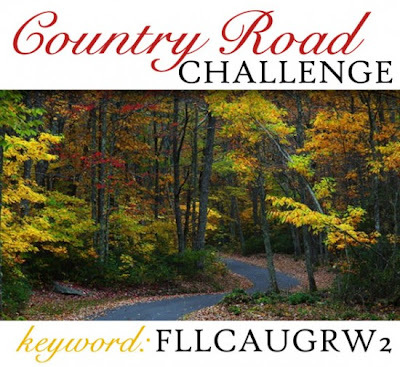 The final challenge for Flourishes Release Week is to share a favorite country road as inspiration! 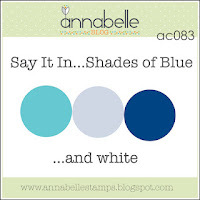 Share a photo, pick colors in the photo and use them in your card or creation. 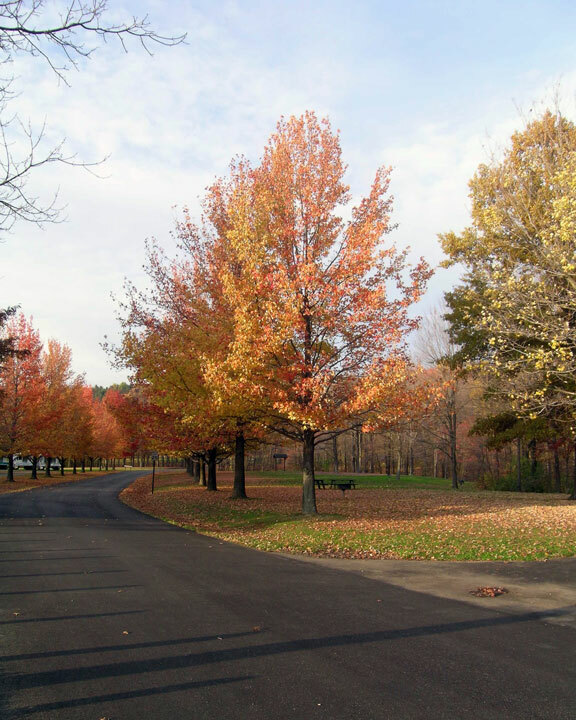 On the left is my photo of a country road from several falls ago when my DH and I were driving through a state park. I colored the background by sponging Memento Summer Sky, Ranger Distress Ink Peeled Green, and Memento Gray Flannel on to Glossy Ivory CS. 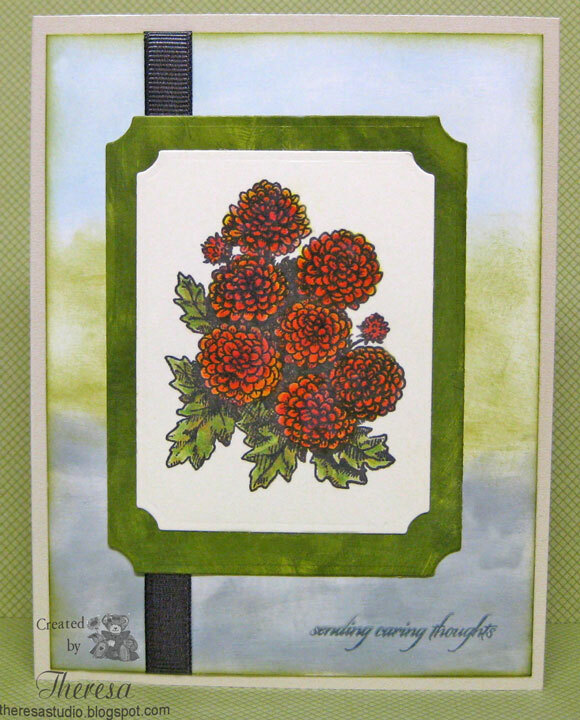 I used the Mums stamp from Flourishes Set 3 of A Year in Flowers for my focus coloring the flowers in Copics pulling out the colors from my photo. Cut the image and a frame (colored with the Distress Ink) using Spellbinder dies. Assembled all together plus a gray ribbon on a card base of Oyster Pearl Glossy CS. 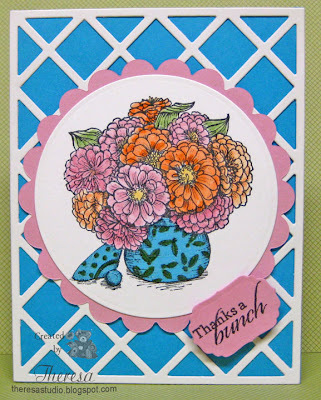 Stamped sentiment from Flourishes "Zinnias" with Gray Flannel. 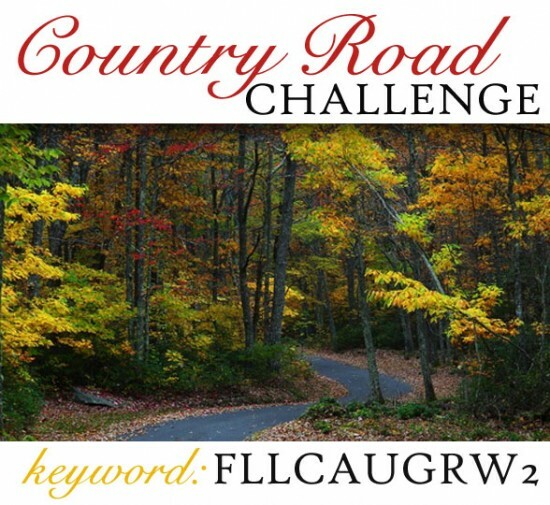 And there you have "My Country Road". Thanks for stopping by and have a great weekend. Maybe check out some of those country roads. 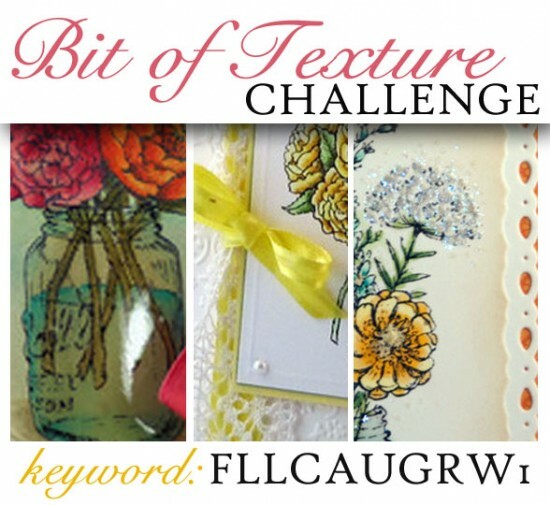 I am back for a second post to show my entry for Flourishes Noon Time Challenge for Release Week. 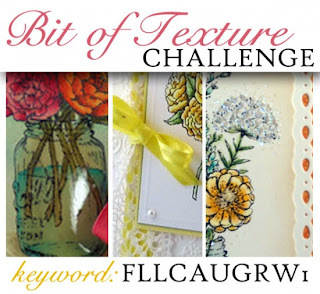 This challenge is all about giving your card a little texture! 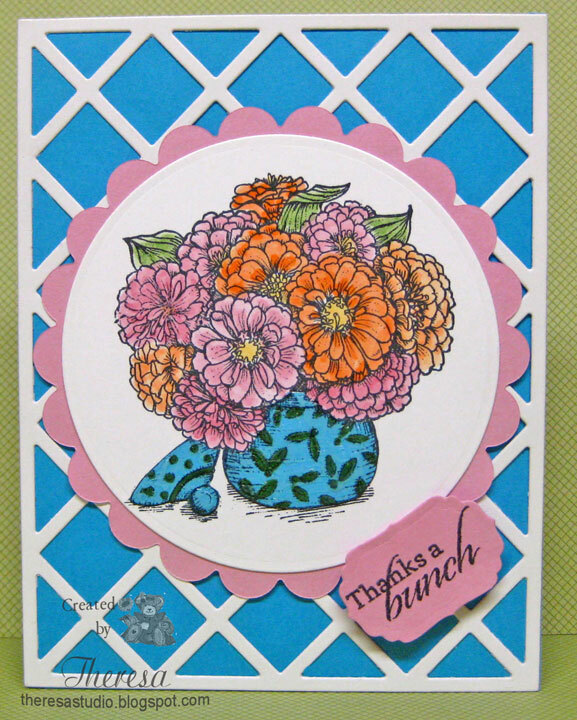 I used Flower soft on the center of flowers, embossing on the striped mat, and ribbon to give texture. I stamped an image from Flourishes "Lenten Rose" with Memento Espresso Truffle ink on white CS and colored with Copics R01,11,20, G20,21,82. I sponged around the image with Distress Ink Peeled Paint after cutting with Nesties Scalloped Die. Finished with Card Base of White CS, Embossed Mat of Graphics 45 DP and ribbon strip and bow. Cuttlebug EF Wicker Weave was used for embossing. 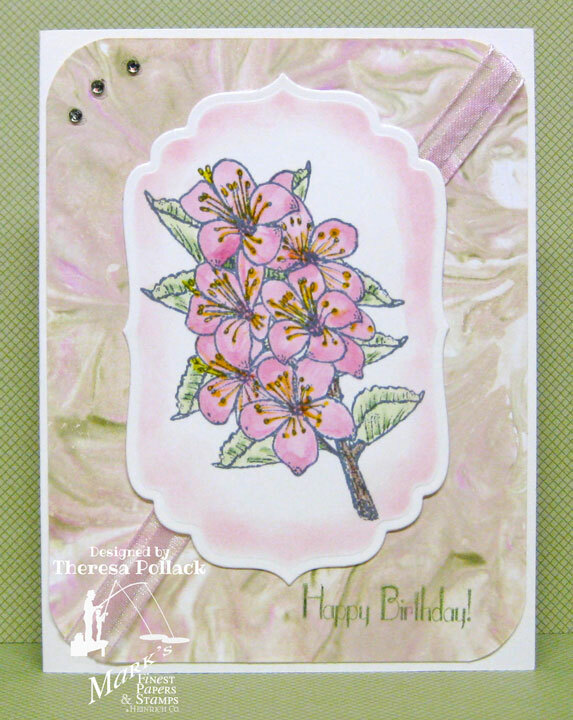 Added Sentiment from Flourishes "Cherry Blossoms" stamped with same ink. I have included a close up of Flower Soft on flowers but still does not show very well.